If you had told me when I was little that one day I would be so crazy about avocado that I would even eat it for breakfast, I would have laughed in disbelief. Because avocado is green. And back then I was *quote* allergic *end quote* to anything green. So the very thought of avocado toast would have been ludicrous. But here we are. Here we are in an age where our news feeds are image after image of the green stuff. But why stop there? If we are going to turn to turn the rules of acceptable breakfast fare upside down, why not go all the way? Which is where ladies and gentlemen, I throw beetroot into the mix. Full of iron, calcium, vitamin A, vitamin B, and a good source of folic acid, fibre and potassium, beetroot is proven to be good for us. So why is the idea of eating it first thing in the morning unfathomable? No more, my friends. 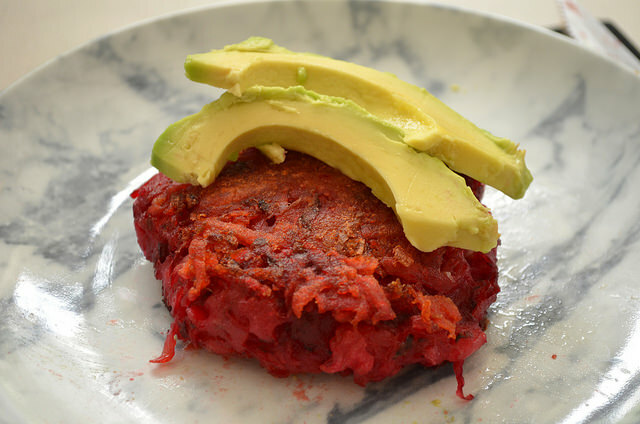 The other morning I made these beetroot rosti's (think of them as classy hash browns, if you will!) and oh my word, why haven't we tried this sooner? Beetroot is good. That is, if you can overlook its messy demeanour. 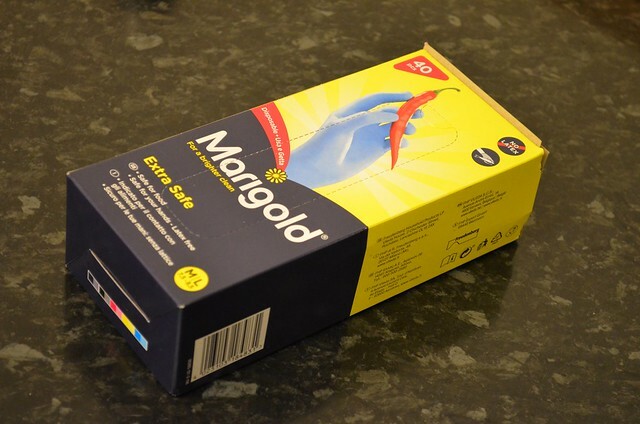 With beetroot forever staining my skin / clothing / crockery / work surfaces, the Marigold Extra Safe Disposable Gloves I was sent to review were perfect for the job. But Lucy, there are so many disposable gloves out there, I hear you say. Why these gloves? All in all, meaning that your hands have the ultimate protection against smells and stains. Which when you cook with garlic as much as I do, is music to your ears. 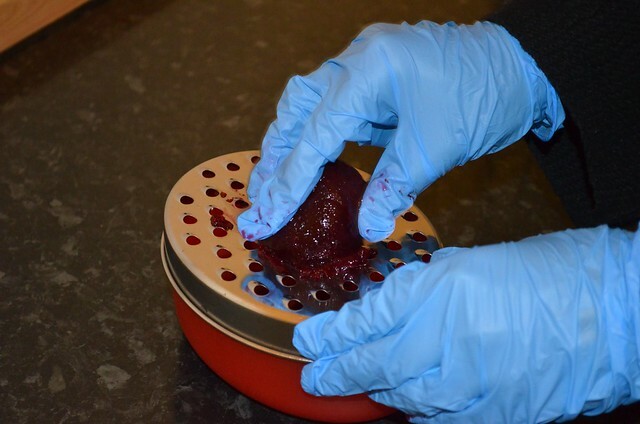 Stains - would the gloves protect my hands from the sheer bloodshed you get from opening a pack of beetroot? Smells - would the gloves help with the classic annoyance of having my hands and nails smell of garlic DAYS after I have cooked with the damn thing? 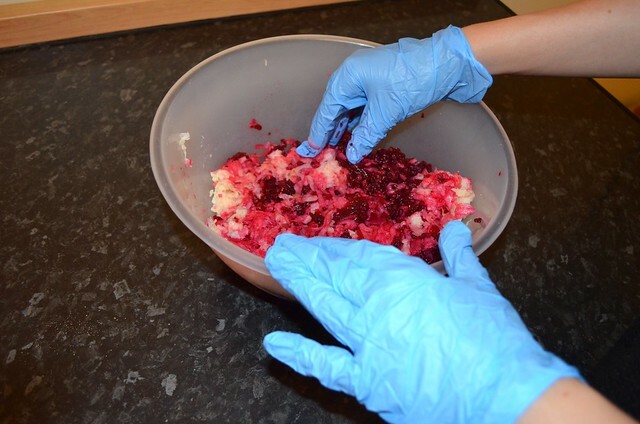 Rips - how would the gloves fare against a grater when I grated the potatoes and beetroot? And I must say, I was impressed. 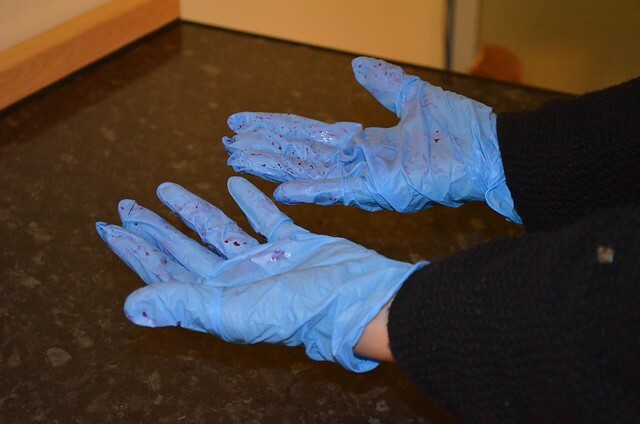 I had already hoped that my hands would be stain and smell free - because that's the very least you can ask from gloves like these. However I honestly didn't expect them to survive the grater. Because I wasn't exactly being light handed on the thing. If I wasn't wearing gloves, I probably would have shred my fingers to pieces! The end result was delicious (the rosti's, not the gloves!). 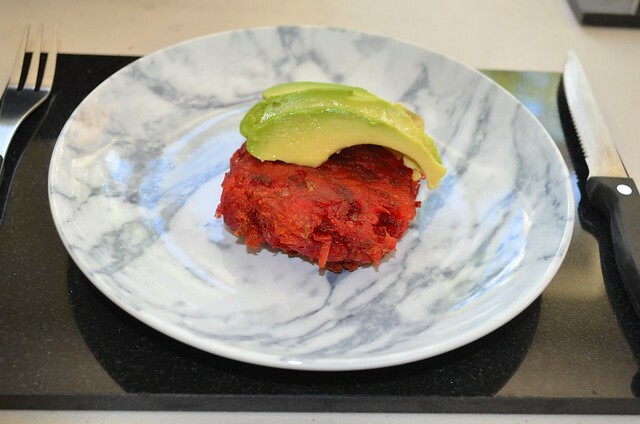 I pan fried each rosti for approx 4-6 minutes on each side and then served whilst hot with a generous sprinkling of rock salt to help enhance the crunch of the rosti, and topped with buttery avocado slices. Because beetroot and avocado is a winning flavour combination (go try it if you haven't already!). And what better way to start your day than with a colourful plate staring up at you? Scrub potatoes to remove any excess dirt. Do not peel as there are so many good nutrients in the skin and it would be a shame to waste them! Bring a large pan of water to the boil and boil your potatoes for 7-8 minutes on a medium-high heat. Run your potatoes through a colander and drain. Leave to one side to cool. Once cool, grate the potatoes. I used this IKEA grater container as it makes grating so much easier and neater, keeping it all contained in one place. Next grate the beetroot - things will get messy! 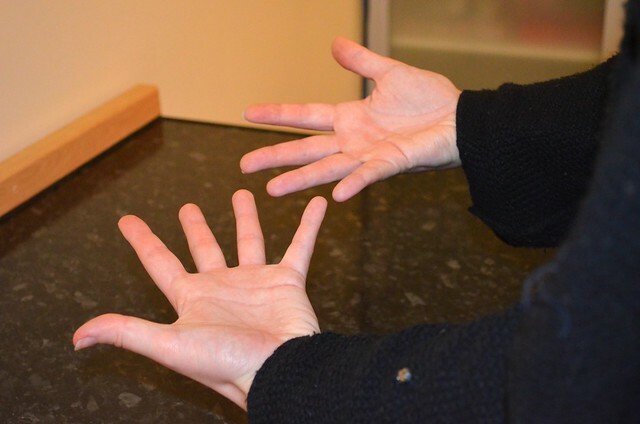 This is where having the Marigold Extra Safe Disposable Gloves came in really handy, protecting my hands. Add the beetroot to the other ingredients in the mixing bowl. Combine and form however many patties you like (I made x8 big ones!). 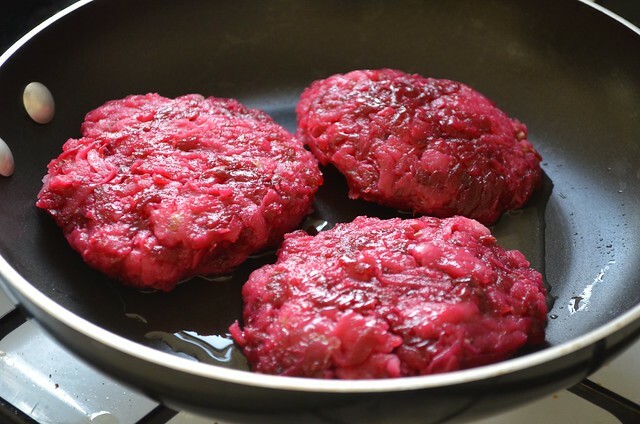 The mixture will very quickly look like super pink burgers! Do let me know in the comments below or by reaching out to me on Twitter or Instagram (I'm @Lucy_Angele on both!) if you give this recipe a try! It's something a little bit different from avocado toast, but is every bit as tasty!